"Joe Mosher is one of the best trainers around. He helped me take my game to the next level as a professional. Joe is extremely dedicated and knowledgeable. He will prepare his clients to reach their goals." Joey was the 2010-11 Canadian Interuniversity Sport (CIS) Scoring Champion & 1st Team All-Canadian. He was the first Canadian to reach 1000 points in the National Basketball League of Canada (Halifax Rainmen). "Joe Mosher's workouts are of professional quality. He pushes you physically as well as challenging all of your critical individual skills. Providing measurable drills in timed settings allows you to track your improvements in shooting percentage as well as basketball specific fitness." Mark was a 4-time Atlantic University Sport (AUS) All-Star with the Saint Mary's Huskies. "I've spent countless hours in the gym with Joe, bettering my skills and knowledge of the game. Throughout the years Joe has consistently been there willing to help me with my game. If you want to become a special player, Joe is the trainer you should work with. He has always been committed to making his players better." Chris is a former NCAA Division 1 player at St. Bonaventure. 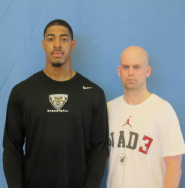 He played in the 2012 NCAA Tournament and currently plays professionally in Portugal. "To anyone considering having Joe Mosher train their son or daughter, I would highly recommend it! Joe is committed to making every kid reach their full potential. He creates an open, supportive and challenging climate . More importantly he provides constructive feedback and advice. 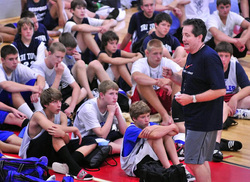 Joe's "backyard" basketball skill development is the type of teaching environment I will continue to send my son to." Gary is a former NCAA Division 1 player at Providence College in Rhode Island.